Today we are announcing the next stage in our evolution… with the launch of our very own Webmaster Tools! This should make it much easier for free (or paid) accounts to register and claim their own websites and therefore view reports on their own sites without any costs. Here’s how you find it. The great thing about verifying with Metatags, for example, is that WordPress users can now verify their sites without FTP access… just as long as you can install plugins. Here’s the instructions for the MetaTag method for my personal site. 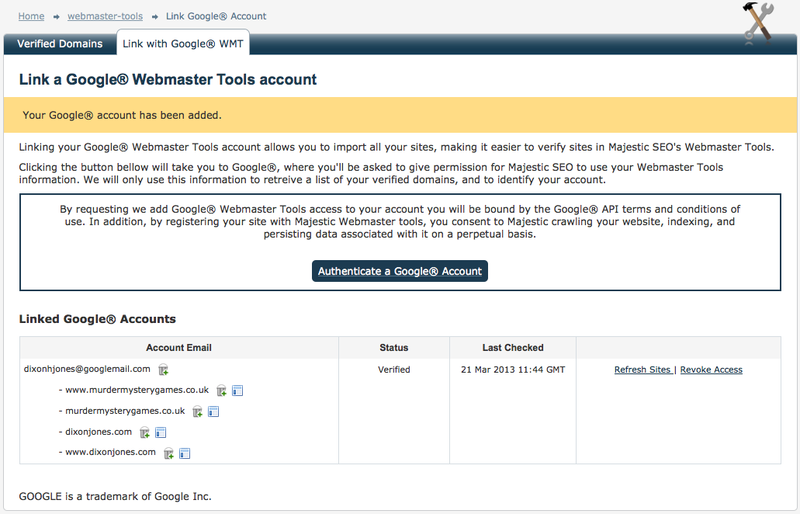 What was that about Google Webmaster Tools? Quite simply – once verified – you can create any Standard, Advanced or Tracking report for your site for free! Just click on the Reports icon ( ) from your control panel and get the data you need. Over time, paying customers will enjoy more functions through using Webmaster Tools. However – right now – all accounts can verify unlimited websites, but Gold and above get to also link unlimited Google® Webmaster Tools accounts as well. What are we giving up? Are you trying to get our passwords? No. We do not need ANY confidential data. Google® uses an authorization system that ONLY gives us the data we need to verify your site. Not your password. Similarly, all of these authentication methods protect you. We cannot “get into your sites” or “Access your Google account” at all. The only thing that you need to concede is that we do need to be able to crawl your site to be able to get your report data for you of course. We will check this as you register and let you know if there is a reason we cannot access your site. This is wonderful news, gotta try it out! 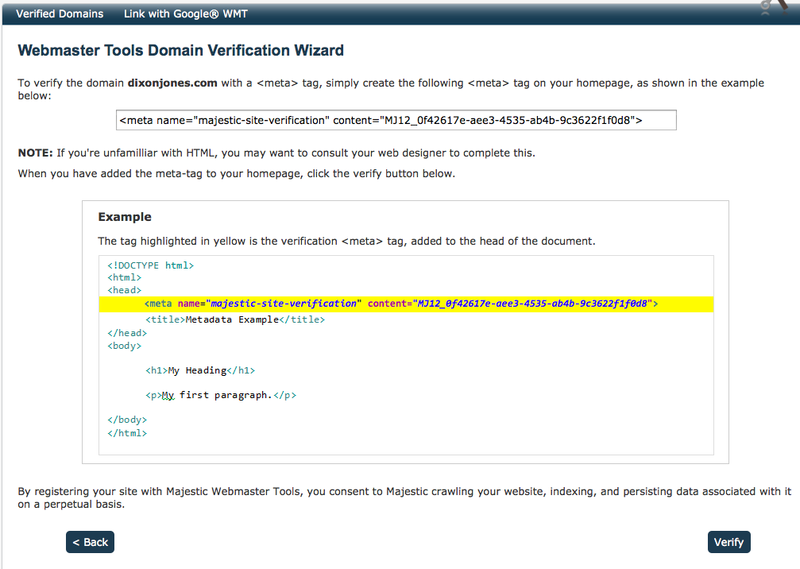 Do you consider authorization using some code snippet that one can insert to site via Google Tag Manager? We’ll accept list of domains that were verified in Google Webmaster Tools as long as account is linked to GWT, this way no extra snippets necessary. > Hi Alex, thanks for reply. Yeah I realized it, but in a case I have a free plan and have access to Google Tag Manager, it would be easier for me to put some code snippet instead of adding meta tag. 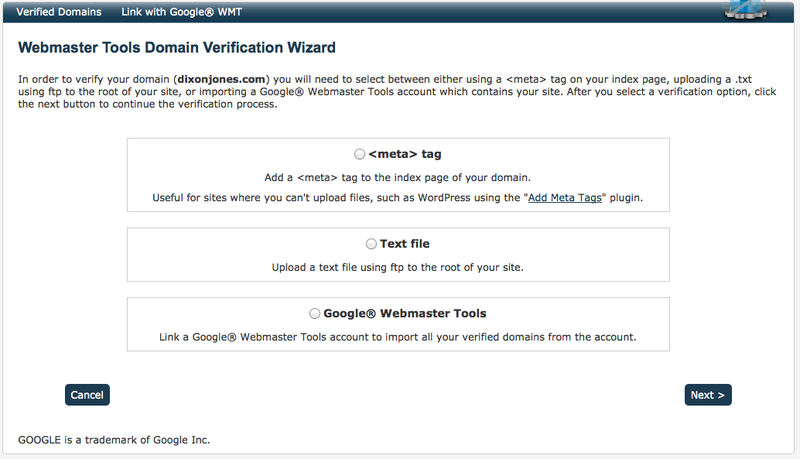 If you can verify your site in GWT using Google Tag Manager, then our system will be able to import those verified sites as well. This way you won’t need to verify same site twice – at the moment we have no plans to support Google Tag Manager directly. Love Majestic tools. Positive that new ones will be as helpful as the previous. Awesome news, and one that will push me to really get active in opening and poking around with a Majestic SEO account. Great job guys :). Very nice Tools. Easy to connect to Google Webmaster Tools. Thanks ! This is a positive step. I’m looking forward to getting my site verified. Thanks. Great job!. Are there any plans to sync with GWT link reports? I don’t think there is an official API command that would allow extraction of that data from GWT at the moment, once it appears then we’d gladly use it. If you believe it already exist then by all means please let us know where we can find more about it (scraping Google data without proper API isn’t an option for us). I’m going to try it out asap. Nice move guys! Thanks for all the positive comments guys. It feels like this is a popular move and ths make us happy! Certainly there has been much “verification” today. Help us spreads the word? Hi Dixon, thanks, I am gonna try this out. I verified by Google Webmaster Tool,yet did not see any icon as you mentioned [What’s in it for Users? 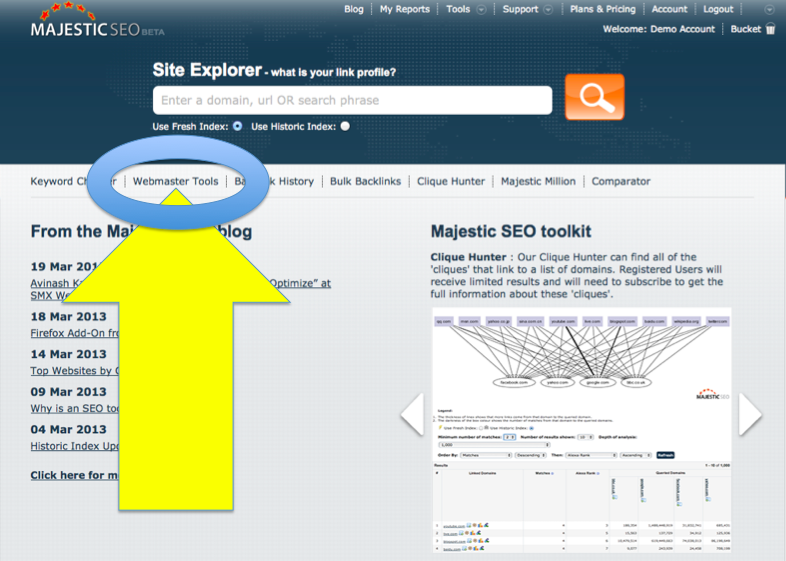 The icons is the little “Scroll” looking icon next to your verified domain at https://www.majesticseo.com/webmaster-tools. I’m going to try it out asap. Thanks for the work done – helpful tool for SEO consultants. What? It’s that big yellow arrow on the image at the top of the blog post? @Dixon I just tried it and I am very please with the tool…thank you very much. However I seem to have a small problem. I added one of my Web Mastertools accounts (which contains nearly 100 different websites) and seems some of them could not verify. Why is this happening and how to fix it? Please set up a support ticket to check this. Great move. I’ll give a try on this new functionnality. Useful to rely less on Google. Really nice and easy to use. I already verified with GWT! How M-SEO can get all the backlinks ? Are there no missings links ? Is there a way to check that with a Google footprint ? Advanced Reports in our system (free to users of verified domains) allow download links found by our crawlers, since the web is so large there are always missing links but given size of our database the data that we have is very comprehensive and it’s free to users of verified domains. There is a way. You can download all the links we report and also in Google’s WMT you can do the same, then compare. You can also use our URL submitter to upload the links that Google says you have in their WMT (We cannot take these directly) and then we will go and check these in our crawl in due course. Of course, we miss links. So does Google. Please remember, though, that we are not trying to copy Google. We are building our OWN map of the web – which is independent. We are only using Google’s API to verify that you own or control the website. The spidering is our own. This is excellent news. Really enjoy the quality of the data I get from Majestic and will be using your services more with this service. Hi there! Forgive the thick-headed question, but I’m not entirely sure what this tool does. As I read it, this is either 1) a tool that enables mass verification of sites in GWT, or 2) a service that offers free advanced reports in exchange for registration of a user’s GWT account with Majestic? Are either of those readings correct, or am I way off-base? 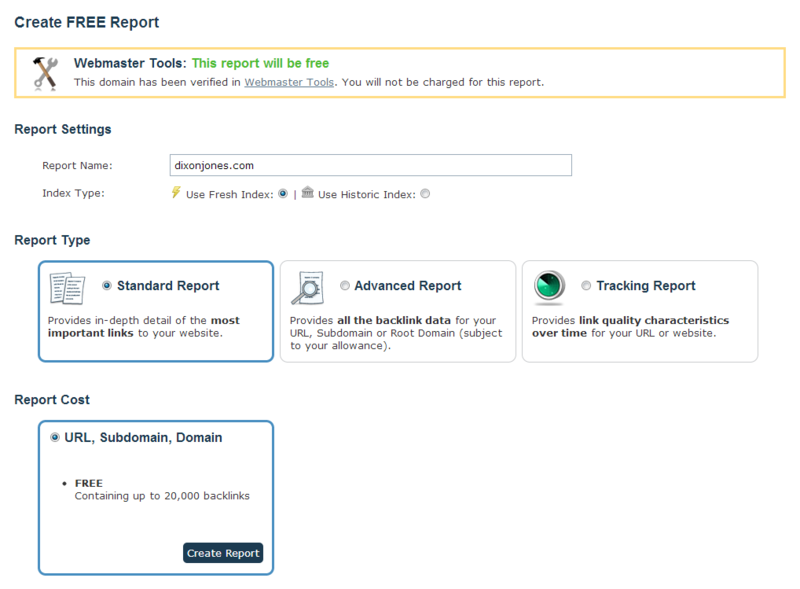 Our service has always offered free reports to owners of verified domains – new integration with Google Webmaster Tools makes it every easy to get such free reports without having to go through separate verification of those domains (which we also support just in case). Our tool does NOT help verify domains in GWT itself. Very exiting news. I’m looking forward to try it out. Excellent high quality product, enjoying working with it. Very user friendly! A good solution to join GWT data. Since you tried to link to an RSS feed about “Reliable Dog Boarding”, you’ll forgive us if we pass. We are a technology, not a consultancy. We do not advise on Page Rank. Thank you for keeping me informed! I’ll try it today. Hi will this tool take data from google cached index ? No, our tools do not scrape Google. No. Majestic’s index is its own. Cet outil est vraiment le meilleur que je connaisse en ce qui concerne l’étude approfondie des backlinks. Rapport détaillé, fonctionnalités performantes et utiles…bref, un grand bravo à toute l’équipe qui travaille sur ce projet, mais surtout un grand MERCI !! Et longue vie à Majestic SEO !! This is a really cool tool! Going to check it out asap! I hope to see more visualization and graph options for this WMT information in the future. it is a good site and most nice tool. Thank you so much.